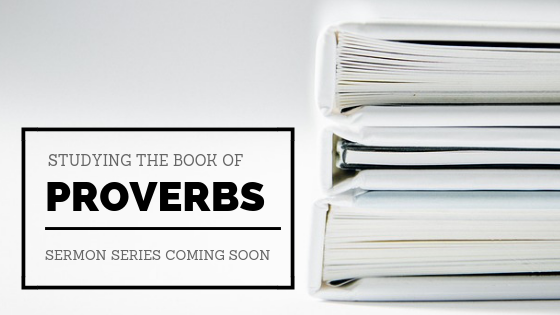 In the New Year we will be launching into a new series in the book of Proverbs and in this post I want to highlight some really good reasons why Proverbs is not only a great book to study but it’s also a timing book to study. Wisdom is something we all lack. Just a quick internet search on the “wisdom” demonstrates that there are rather mixed messages when it comes to what wisdom actually is, and how to get it. Professor of New Testament at the Wheaton College, Douglas Moo, suggest that the best definition of “wisdom” is a God-given grace that “involves biblical insight into God’s purposes and ways.” I like that! We all want to have biblical insight into God’s purpose and ways don’t we? Well, Proverbs provides the basis for this. So what do we do with wisdome? Proverbs was written for Solomon’s sons so that they might read and understand how to walk with God. Throughout the book, we hear beautiful father-son language with which Solomon appeals to his children. So used rightly, wisdom provides the basis for righteous living. This means that as a church we need to learn how to speak to one another “the wisdom of God” in a father-son way. We need to learn to gracious and lovingly speak to one another about pursuing holiness and fighting sin and temptation. It reminds us that instruction from God’s Word is the foundation from which we speak to one another about pursuing holiness and fighting sin and temptation. It’s not our cultural perspective or church experience – it’s the Word of God. Of course, the source of this instruction is God Himself but the means of this instruction is the people God has put in our lives who love us. The general tone of this book, when talking about righteous living, is very much instruction, encouragement and affirmation. This is what we need to learn to model to one another. Proverbs helps us to see the value of pointing out the joy of obedience because walking in wisdom brings great blessings. Set it juxtaposition against the blessings, Solomon also points out the consequences of foolishness. Just a brief read of the text often demonstrates this as Solomon regularly distinguishes the way of wisdom from the way of foolishness – the way of obedience and the way of disobedience – the way of the blessed and the way of the cursed. In short, says Solomon, there are consequences to sin, and with tear-filled eyes, as a loving father, he does everything to warn his children of those consequences. Since King Solomon wrote the book for his children, who were to inherit the throne, one of the greatest dangers that they faced was the temptation to rely on Israel’s enormous wealth and power to accomplish these things. But, to live in such wisdom, Solomon says, we must rely on God. This is crucial for us because there is a danger that in our pursuit of righteous living, we not only become the authority for it, but we also become the power for it. This is what led God to warn Zerubbabel that it’s “Not by might nor by power, but by my Spirit” and we need to be constantly reminded that our only hope for waking in wisdom is found in Christ. It’s impossible in our own strength and if we don’t understand this, the best that we will get out of our study will be a collection of meme and “truisms” that will help us get along better in this life. The worse thing is that we slip into man-made self-righteousness. In other words, Solomon isn’t teaching his sons how to have their best life now. He’s preparing them to be the primary covenant keepers in Isreal. the very fact that we have the book of Proverbs to read should remind us that, left to ourselves, we would never choose the path of wisdom. We need intervention from outside of ourselves. This intervention comes in the form of a King who not only sits on a throne (Psalm 2) but has already walked the path of wisdom in our place. A King who is described as the “wisdom of God”. The blessings in proverbs are ours by inheritance as God’s sons. Through faith in King Jesus, all the covenant promises will be ours for all eternity. Through King Jesus, we’re equipped to walk the way of wisdom.